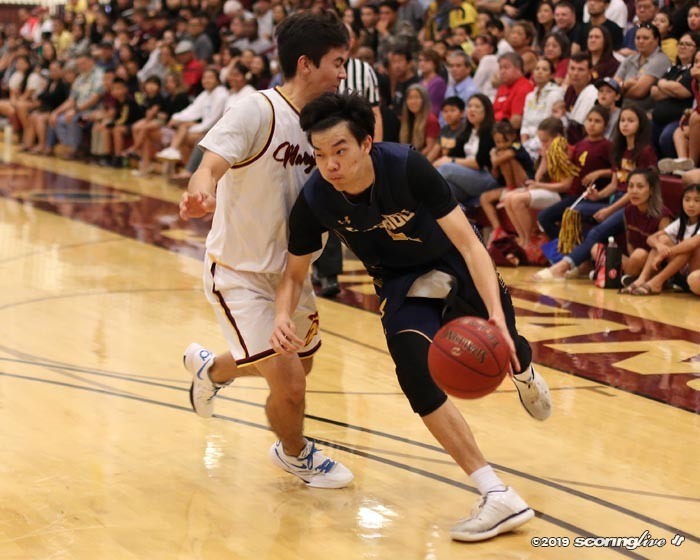 MAKIKI — Makoto Kamata made both of his 3-pointers in the fourth quarter, the second to give his team the lead for good with two minutes and 38 seconds remaining, and No. 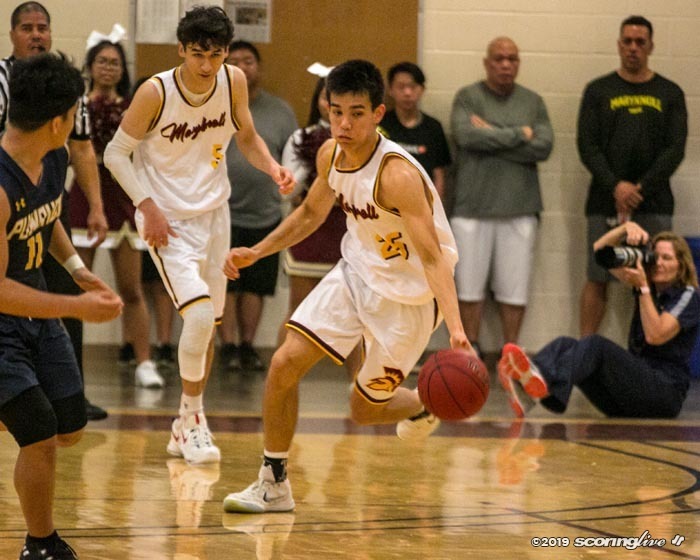 2 Maryknoll pulled out a 55-49 win over top-ranked Punahou in Interscholastic League of Honolulu boys basketball Saturday afternoon. A near-capacity crowd on homecoming at Clarence T.C. 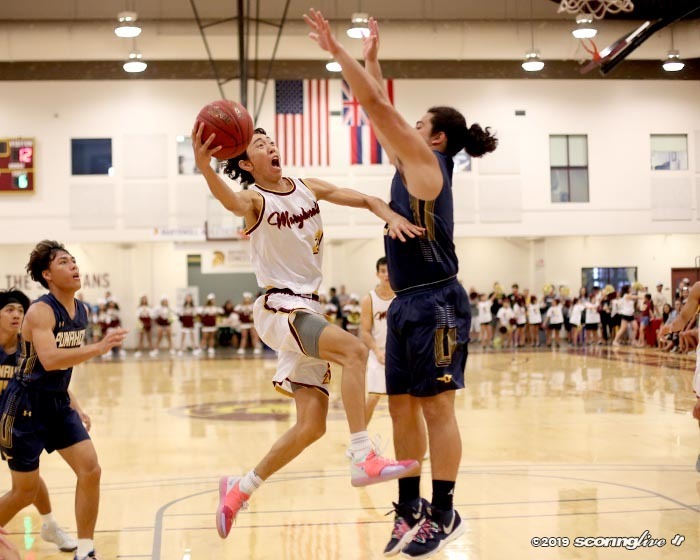 Ching Gymnasium saw the Spartans (4-1 ILH, 18-2 overall) rebound from a one-point loss against No. 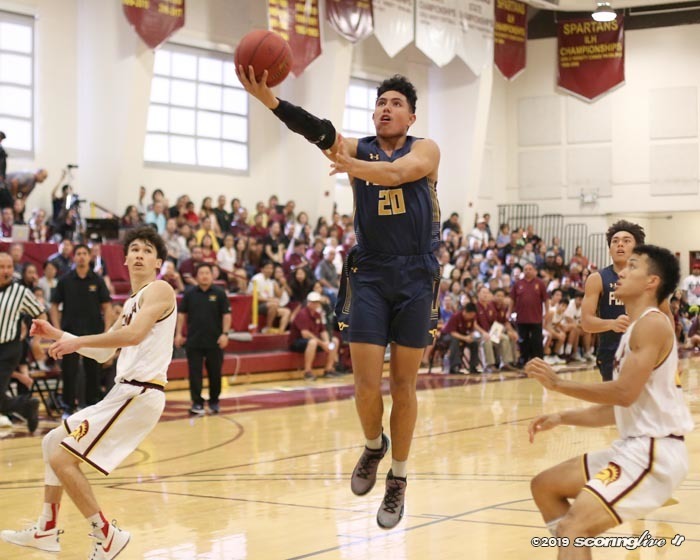 7 Kamehameha two nights prior to move into first place in the ILH Division I standings. 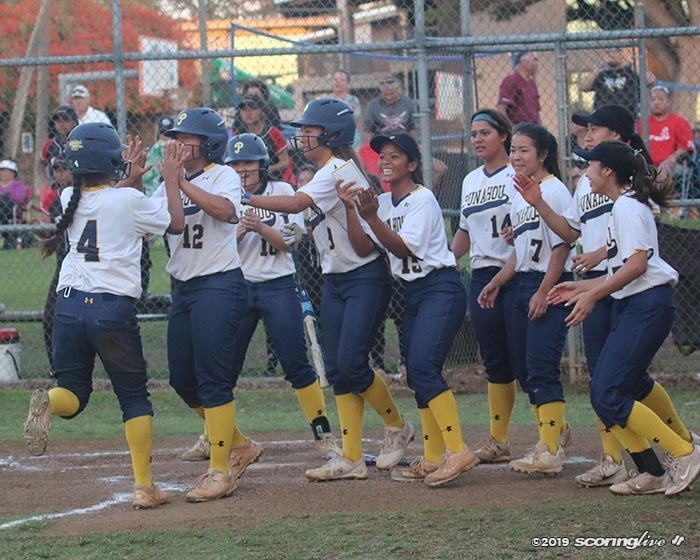 It was the first loss for the reigning state champion Buffanblu (3-1, 18-2). "This is a good win. 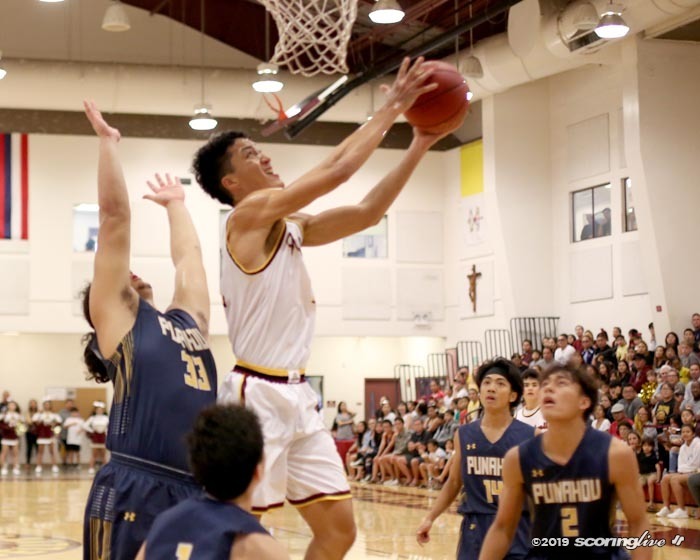 Any time you win your homecoming — I mean, I don't care who you're playing — but it was nice that we played against Punahou and we won," Maryknoll coach Kelly Grant said. 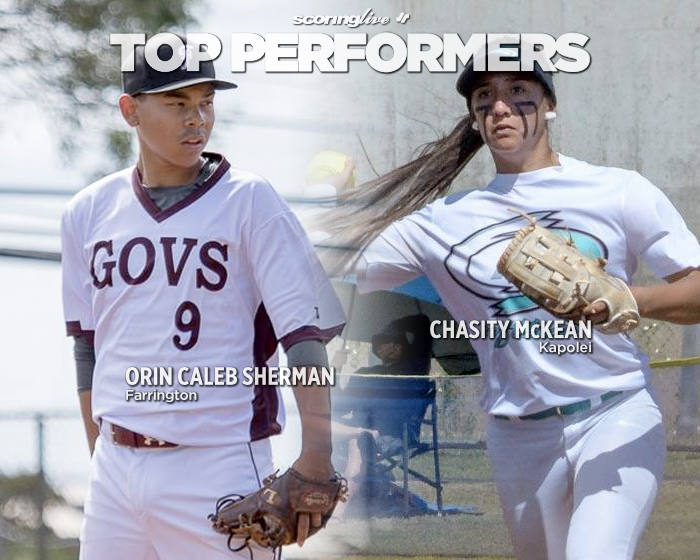 "The crowd was amazing, everybody was cheering. 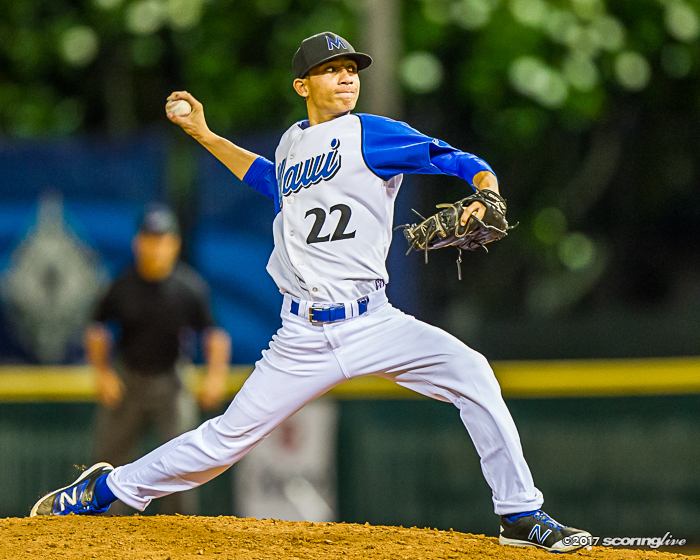 It was a good game." 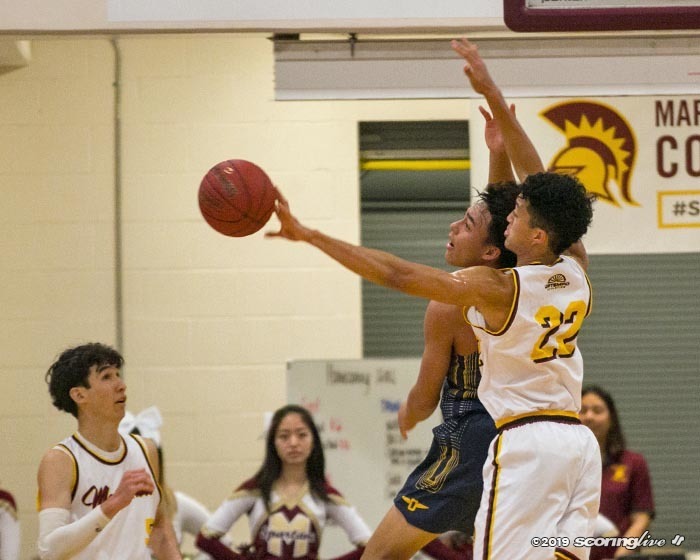 The Spartans were led in scoring by a trio of seniors. 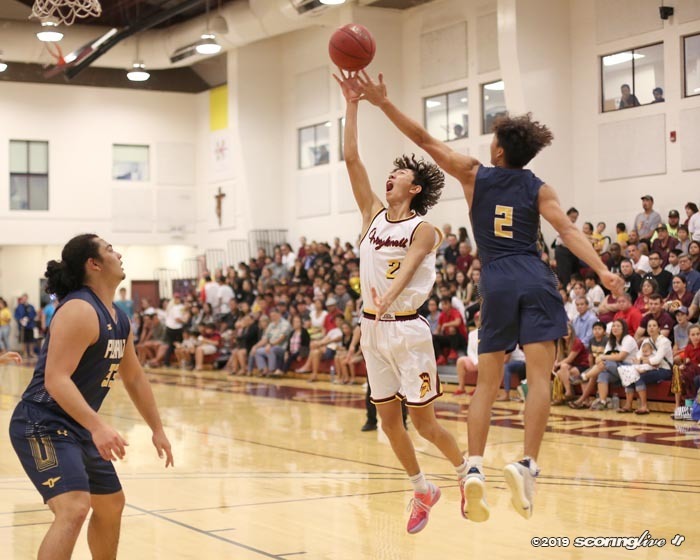 Marcus Tobin shot 6 of 7 from the field and netted a game-high 15 points, Kamata scored nine of his 14 points after halftime to go with a game-high seven rebounds and Kalai Akaka scored all 10 of his points in the second half, including a 6-for-6 effort at the free-throw line. 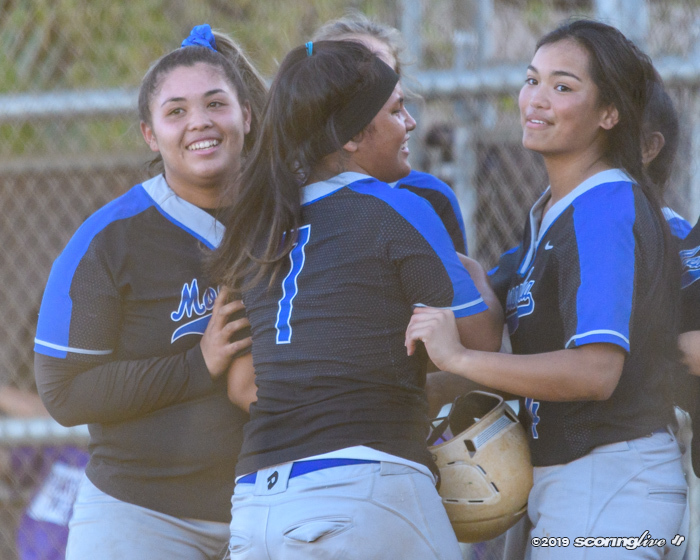 The teams exchanged 5-0 runs within the first two minutes of the fourth quarter. A Duke Clemens reverse layup gave the Buffanblu a 42-40 lead with 5:32 left to play. 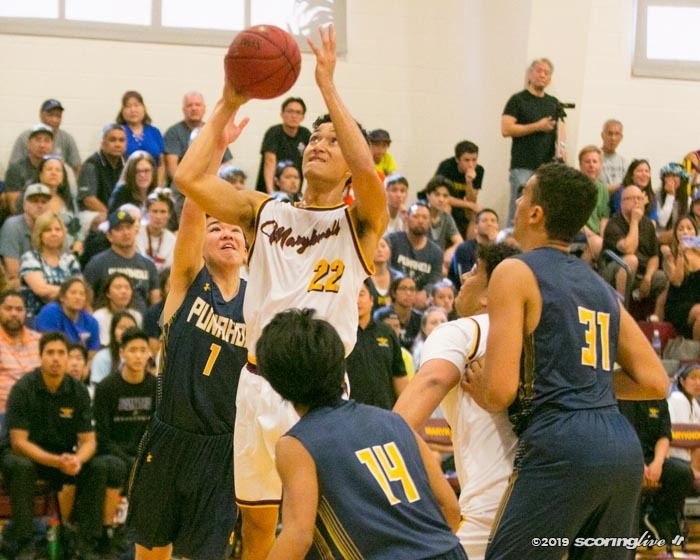 However, Maryknoll tied it on its next possession with Payton Grant's putback with 4:58 remaining. 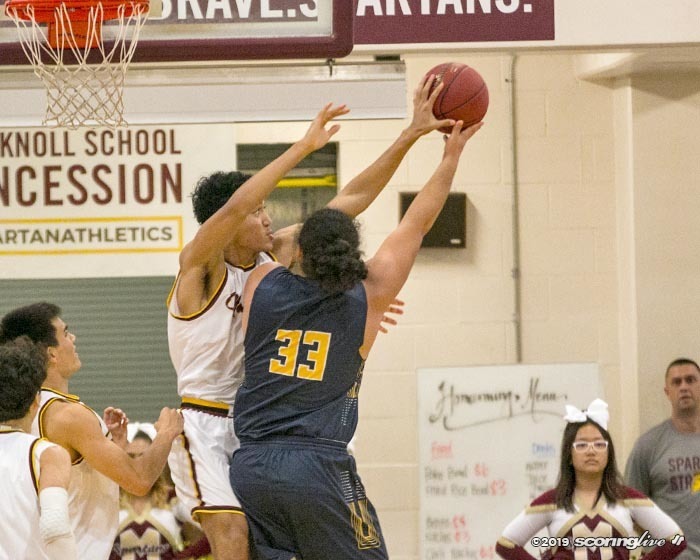 The Spartans got a stop on the other end of the floor and pulled ahead with 3:55 left when Akaka hit both ends of a one-and-one opportunity. 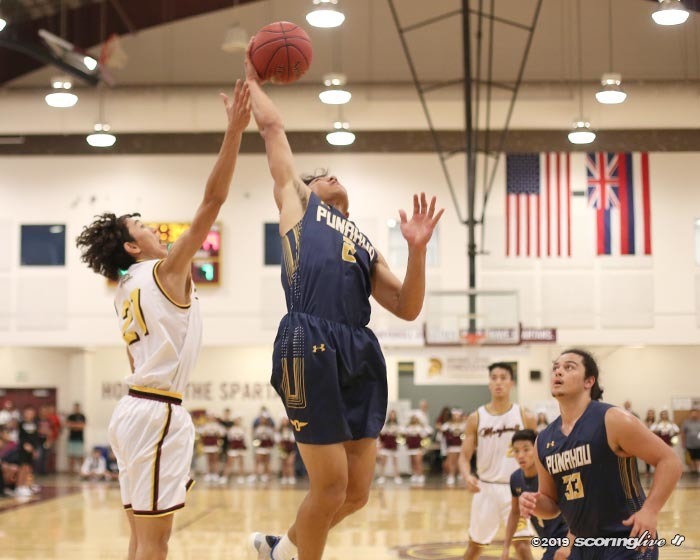 Punahou tied it at 46 on a pair of Kaulana Makaula free throws with 2:53 to play. 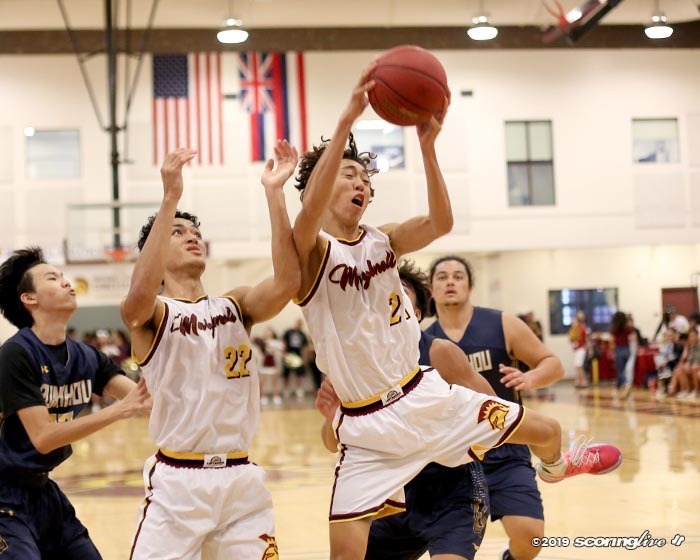 On Maryknoll's next possession, Kamata fed the ball into Tobin in the post. Tobin quickly got the ball back to Kamata on the left wing and Kamata drained a 3-pointer to put his team ahead 49-46. "It was supposed to be a shot for Marcus, but because Makoto's defender came in it was just a touch pass to Makoto. 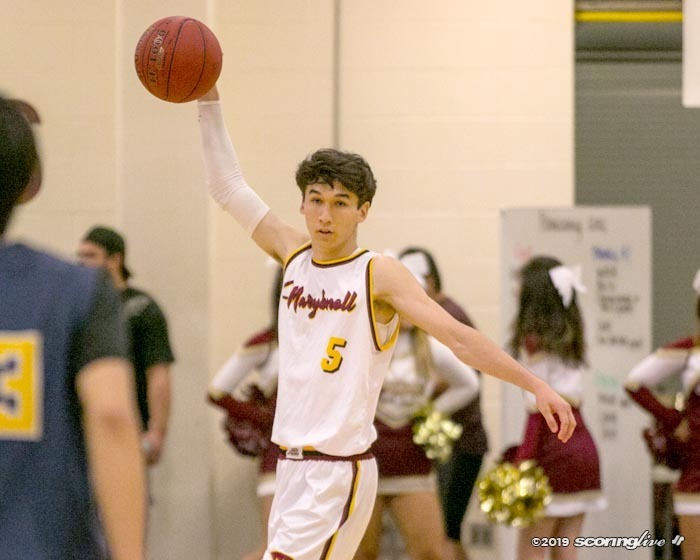 That was a big shot," Grant said. 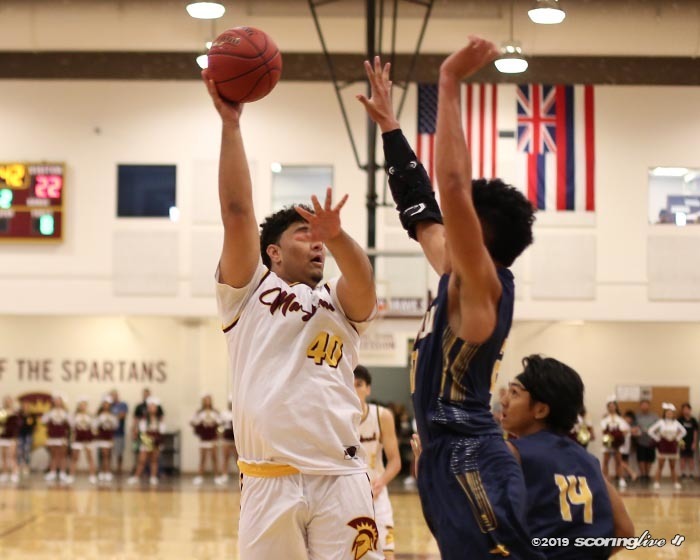 After Makaula missed the front end of a one-and-one, Niko Robbin drove for a layup to stretch the Spartans lead to five with 2:19 remaining. 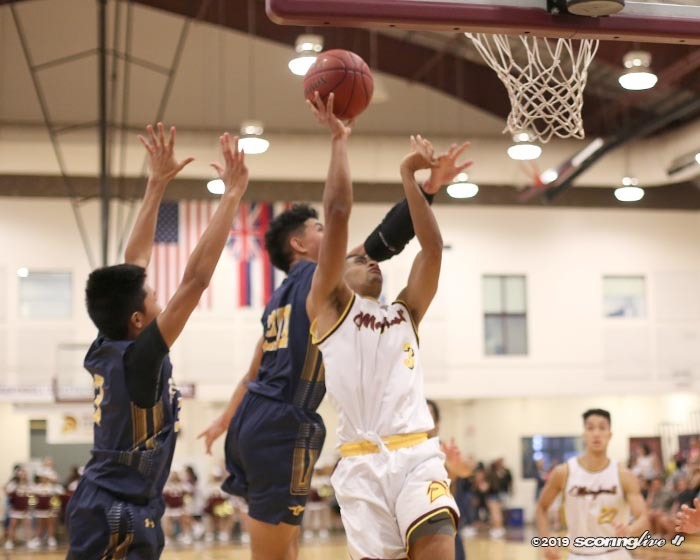 Makaula converted a three-point play with 1:52 left to cut the Maryknoll lead to 51-49, but Kamata answered with two free throws. 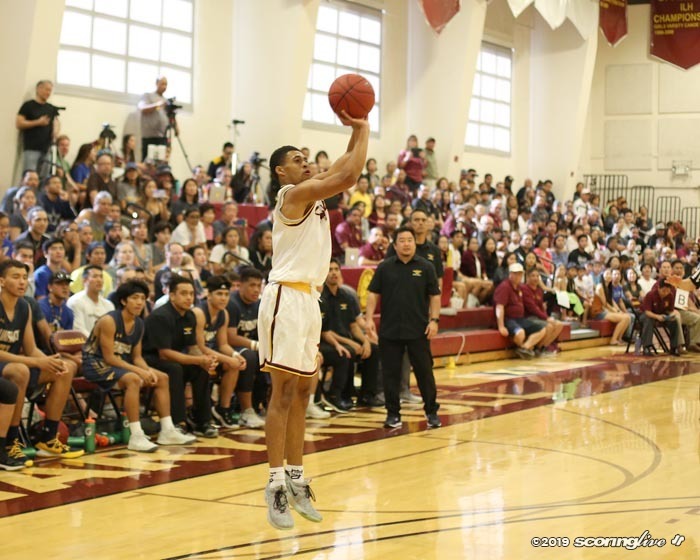 After a turnover by the Buffanblu, Tobin put the game on ice with two more from the charity stripe. 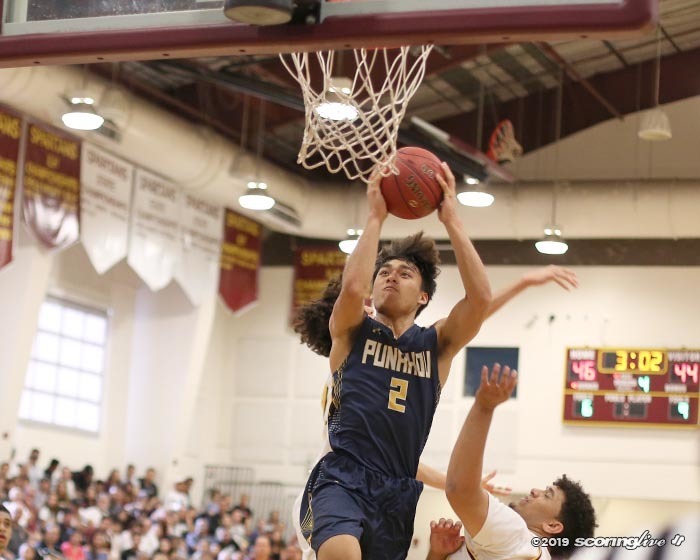 "They hit some big shots and we missed a couple and we had a couple possessions went their way," Punahou coach Darren Matsuda said. 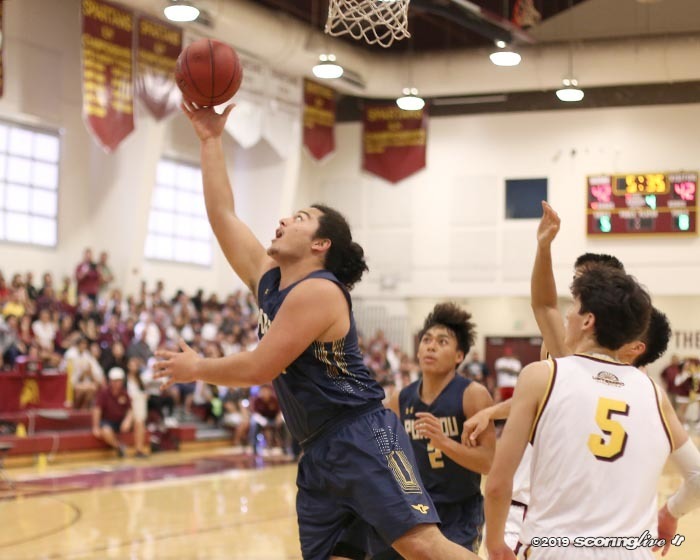 "I thought both teams played a really good game, a real focused game. 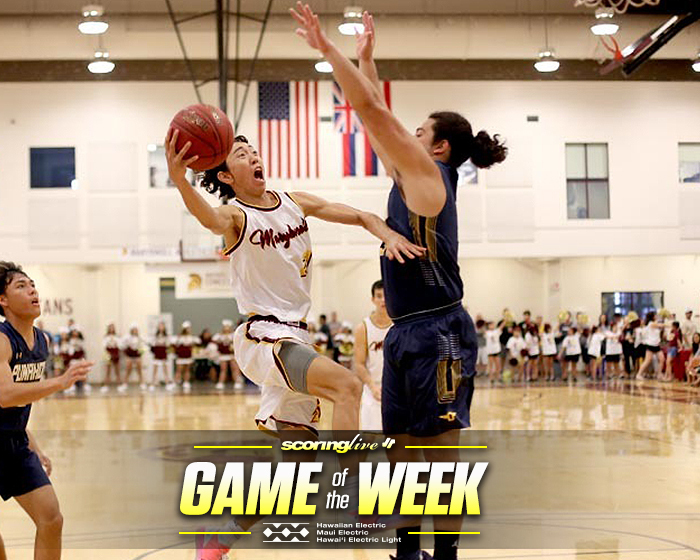 They had a little run, we had a little run early, they had a little run late and then in the end it came down to free throws a little bit — they made a couple, we missed a couple — and Makoto hit that big 3 and then we missed a couple big 3s, so that's the way it goes." 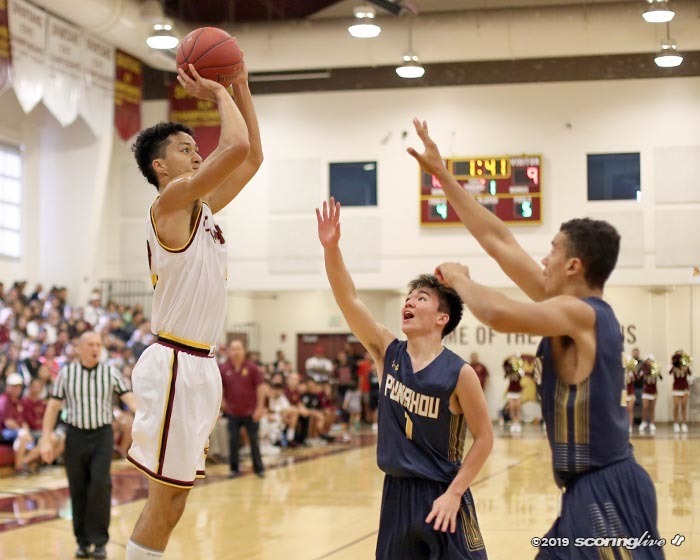 After it was just 2 of 8 on free throws in the first half, Maryknoll shot 11 of 15 from the line after halftime, including 8 of 10 in the fourth quarter. 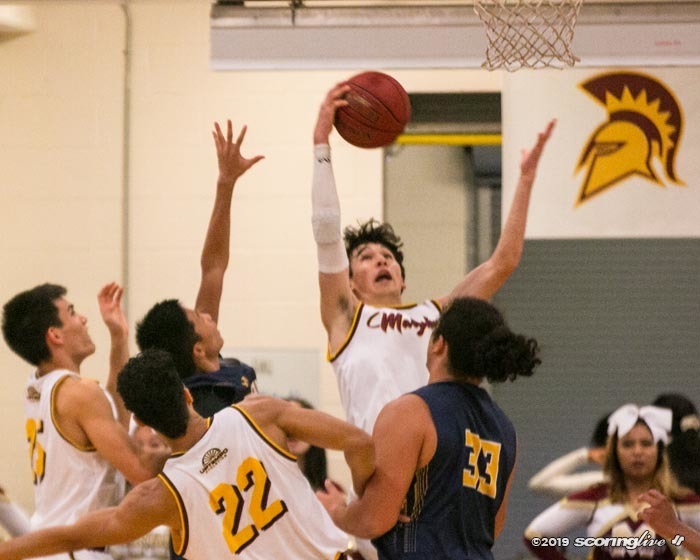 "To be honest with you, I told them that they were shooting the ball wrong," Grant said. 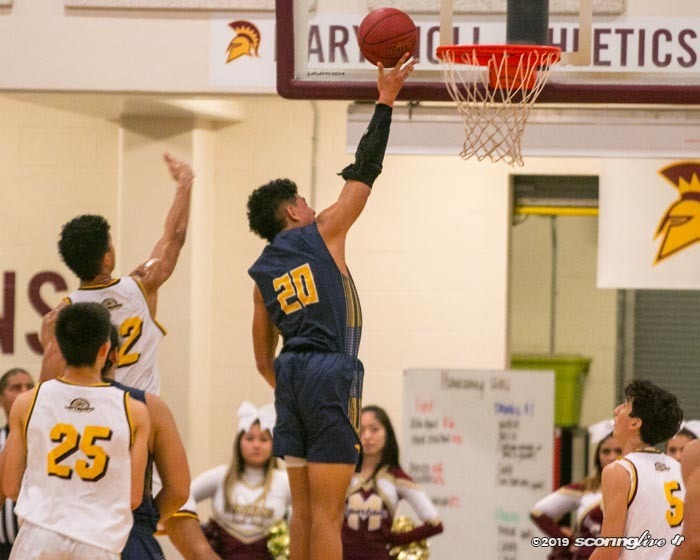 "There's a mechanical thing that I strongly believe (in) that they weren't doing and once they corrected that, the balls were going straight in. Everything was missing to the right, so it was a mechanical thing." 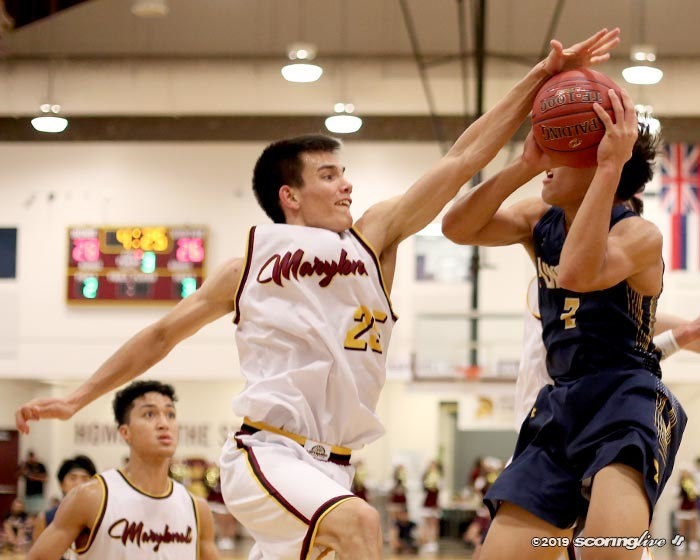 Maryknoll shot 19 of 35 (54.2 percent) from the field to 18 of 45 (40 percent) for Punahou and also won the rebounding battle, 27 to 20. 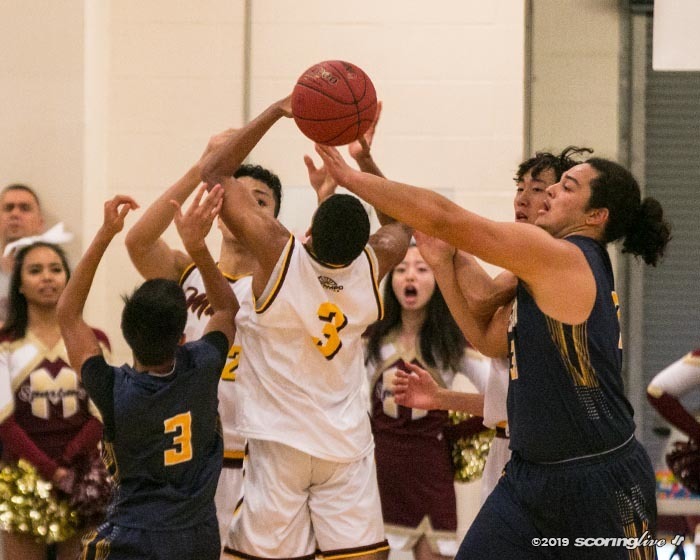 The Buffanblu were 8 of 13 shooting on free throws. 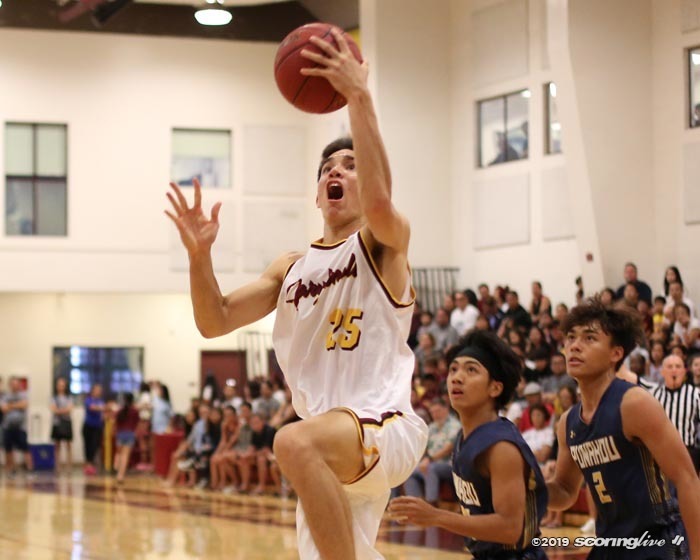 Grant was pleased to see his team bounce back from a poor shooting performance against Kamehameha Thursday night. 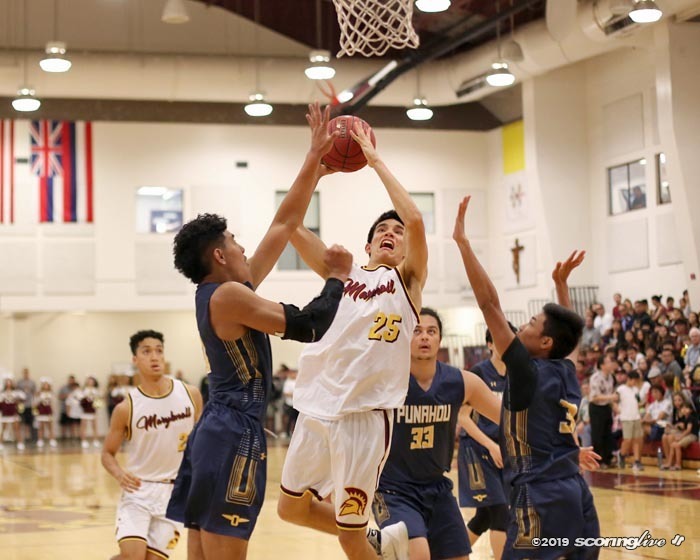 "When we played against Kamehameha, we wanted to try and get inside the paint because we were missing all of our shots and when we we were getting into the paint, because they're so big, they were altering our shots," Grant said. "I told them today, ‘You guys cannot go away from, if you're open, shoot it — because we're a good shooting team — but you need to remember, that ball's got to get into the paint once in a while,' because once the ball gets in the paint, they gotta crash down, we can skip the ball to the opposite side and that's where we get open shots." Four players scored in double figures for the Buffanblu. 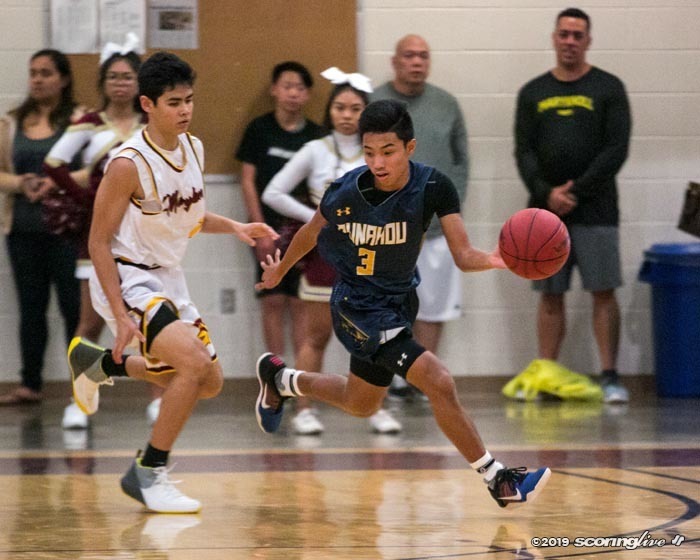 Makaula scored 10 of his team-high 14 points after halftime, Jakob Kimura netted 10 of his 13 in the first half and Ryder Hsiung and Duke Clemens added 11 apiece. "I think the game could have went either way, I thought. 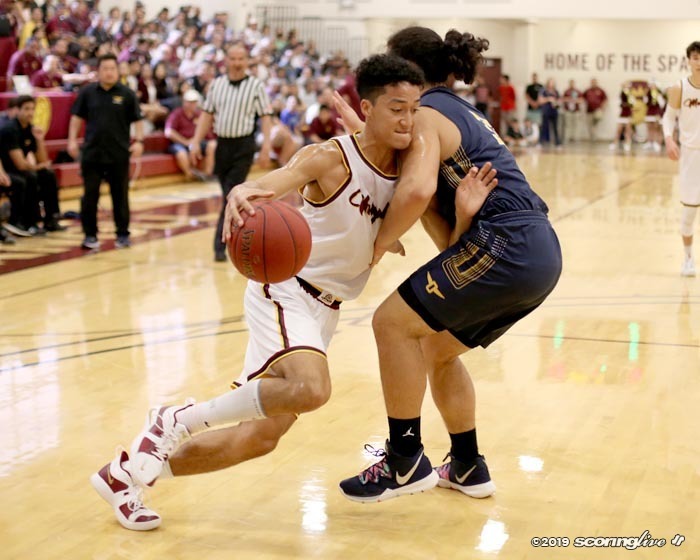 The ball bounced in their favor a little bit in the last two minutes and that's the way it goes," Matsuda said. "It's early. 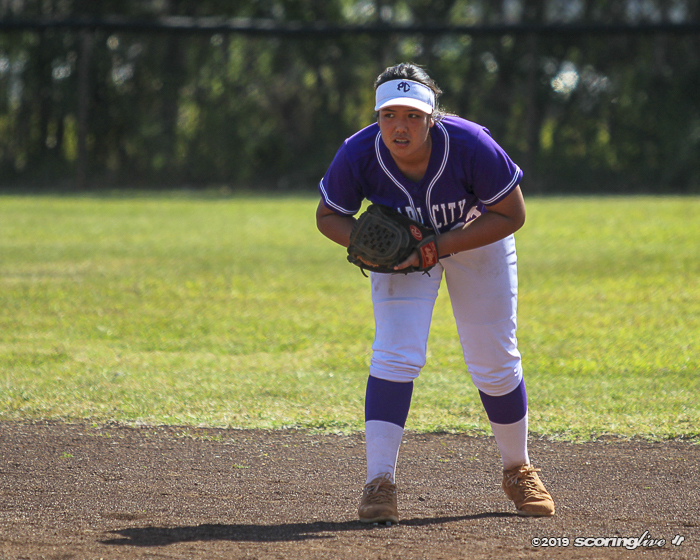 It's early in the season, so win or loss it's the same thing, we just keep doing what we do." The teams were tied at 24 at the half. There were seven ties and 10 lead changes. 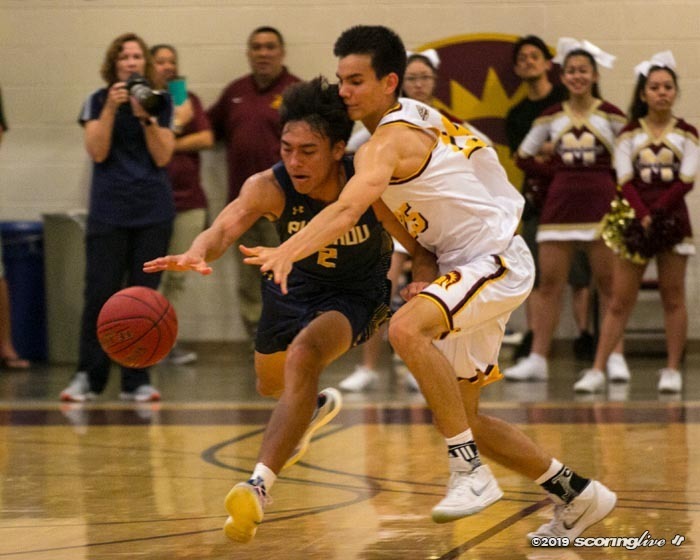 It is the first of two scheduled meetings between them this season. 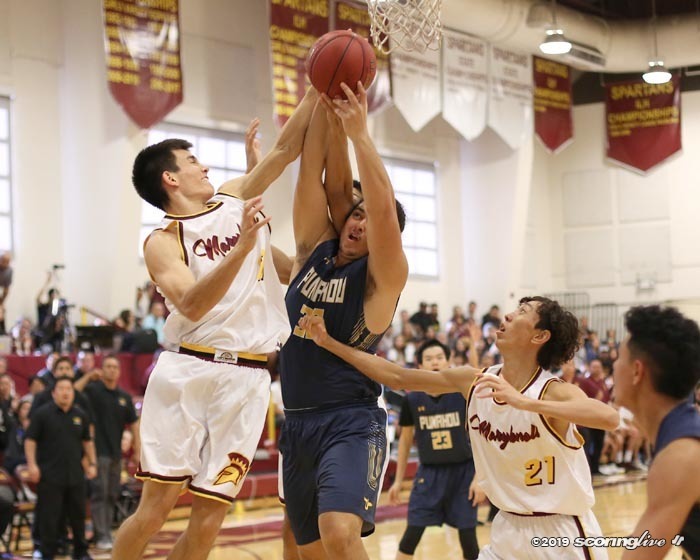 Maryknoll will visit Hemmeter Fieldhouse for the rematch on Jan. 26. 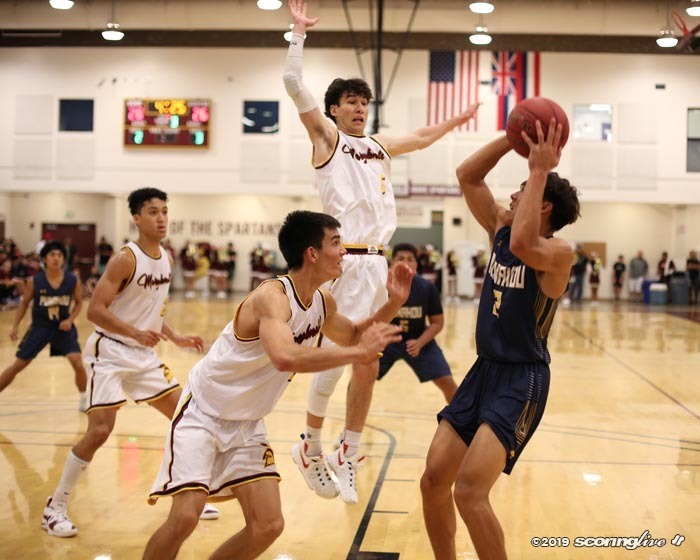 After playing their third game in five days, the Spartans will enjoy six days off before returning to the court to host Mid-Pacific next Saturday. 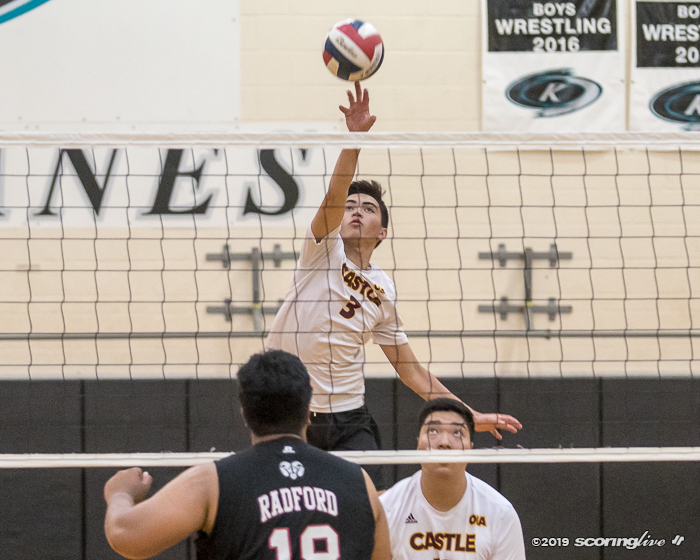 "With Niko's knee a little bit banged up and Makoto's finger banged up we have a week off to recuperate, so we're gonna get in the weight room and get our bodies stronger again," Grant said. 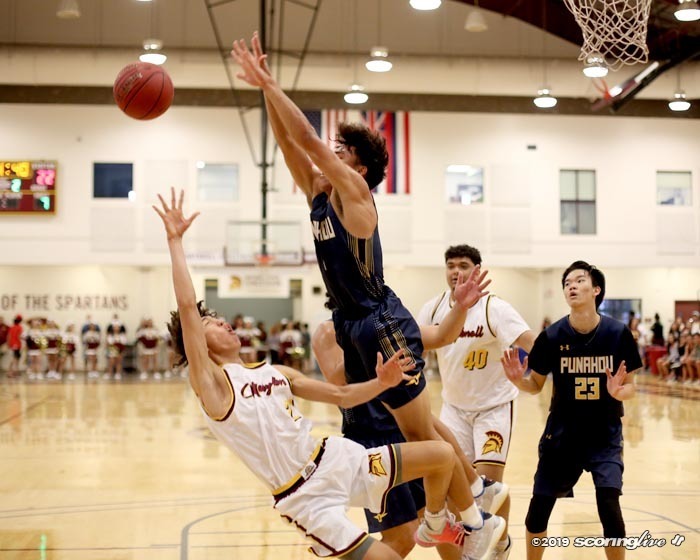 Punahou will keep busy next week with three games on its home court. It will host No. 3 Iolani Tuesday, No. 6 Saint Louis Thursday and No. 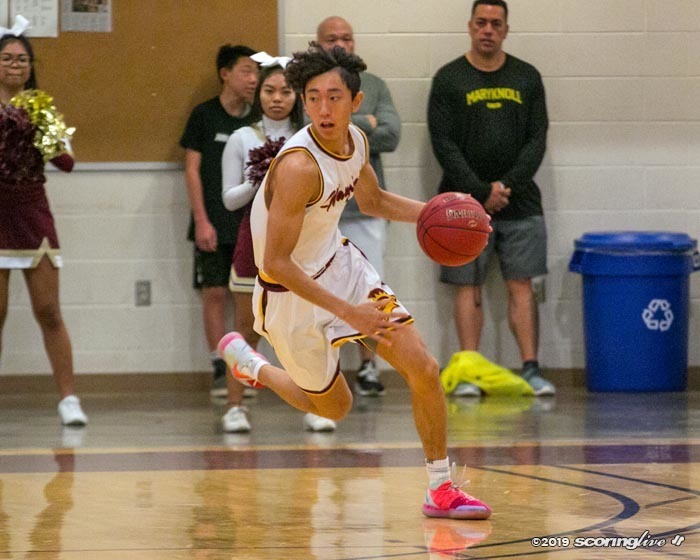 7 Kamehameha Saturday.